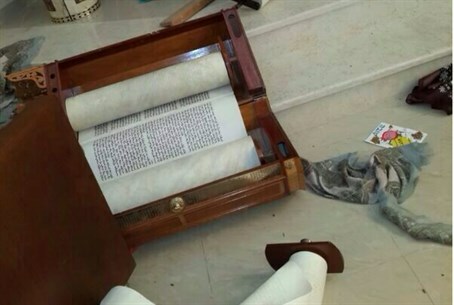 Town between Ashdod and Ashkelon has two synagogues broken into by vandals who ripped Torah scrolls and threw them on the floor. A volunteer arrived at a synagogue in the town of Ezer, located near the coast between Ashdod and Ashkelon, to find the house of worship broken into. Vandals had broken the Torah ark door off its hinges and torn Torah scrolls which were found thrown on the floor. Police forces, headed by Kiryat Malachi police commander Sammy Marciano, arrived on the scene for an examination to locate the escaped vandals. "This is a serious case, at this stage we are checking all angles of investigation to locate the suspects," reported Marciano. Southern District Police Commander Yoram Halevi commented on the incident as well, saying "the images of the Torah scrolls ripped and thrown down are very difficult to look at. This is an extremely serious case, I've given priority to the investigation so as to reach those who committed the criminal acts as soon as possible." Vandalism of synagogues is unfortunately not uncommon, even in Israel. Just last week a resident of Tel Aviv was arrested for vandalizing a local synagogue with Nazi graffiti. Meanwhile, last August a synagogue in Jerusalem was broken into by vandals who damaged Torah scrolls and threw them on the floor. During the snowstorm in December, vandals took advantage of the harsh weather to break into King David's Tomb and deface all of the site's newly donated religious holy books with a stamp bearing the name of the non-existant "Academy - King David."